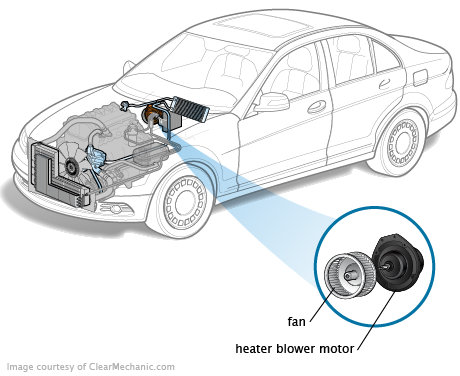 The heater blower motor turns the fan that provides airflow into the passenger compartment. Heater blower motors can be damaged by fluid leaking from a heater core or evaporator. Any fluid leaks near the heater blower need to be resolved or the new heater blower will be ruined. After the repair, the heater motor should run normally at all speeds and in all modes, such as defrost, heat, etc. The new motor should be quiet and not vibrate. When replacing the blower motor, the electrical connections should be thoroughly inspected. A poor connection can result in erratic bower motor operation. Blower is vibrating loudly even though it is loud. works for heating or cooling.